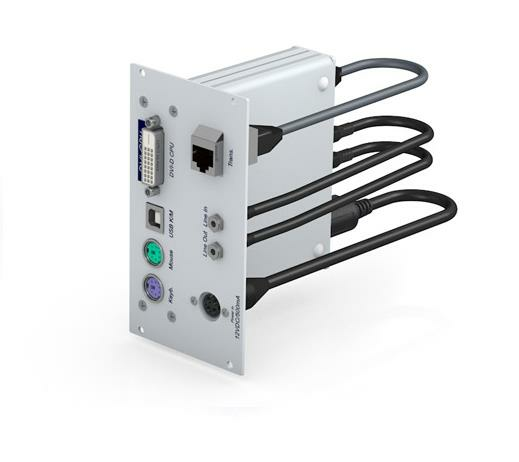 The DVI-CPU-FSC computer module variant offers all the connectors of the device on the front, designed for rackmount usage. The DVI-CPU-FSC computer module links external keyboard, video, mouse, and audio interfaces to the ControlCenter-Digital. The computer modules link external keyboard, video, mouse, and audio interfaces to the DVICenter system. In combination with relevant DVICenter components, computer modules link external interfaces to the DVICenter system. DVI-CPUs combine signals, process them, and use CAT cables to transmit the signals to the DVICenter. Any DVI-CPU has a unique ID that helps identifying the device within a DVICenter system. The FSC variant offers all the connectors of the device on the front. This solution was especially designed for rackmount usage.